Hello and Thank You for checking out our latest Restored Studebaker Avanti up for sale by The Motor Masters! 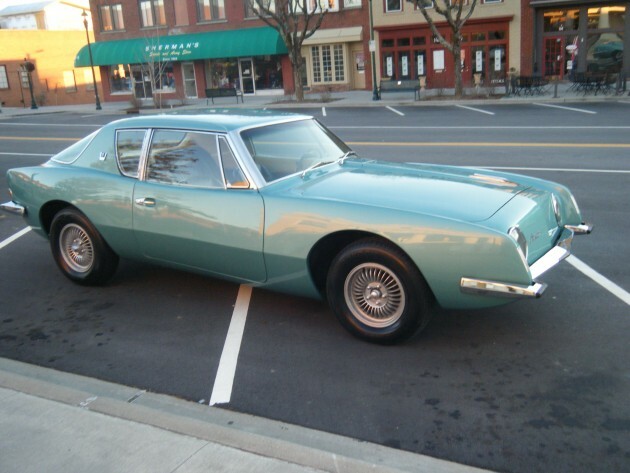 Up for sale is a LOW MILEAGE 1963 Studebaker Avanti R1 with ONLY 25,173 ORIGINAL MILES! THESE ARE TRUE DOCUMENTED MILES!!!! This Beautiful Classic was bought from an Estate Sale that had been in Storage since 1977….A TRUE BARN FIND!! VIN IS R4806. Exterior is Turquoise Blue and Interior is both Black and Tan. Has the Factory Original 289 V8 Engine with 240 HP and Automatic Transmission. Other options include Power Steering and Power Brakes. It even has the Factory AM/FM Studebaker Radio AND IT WORKS! HERE IS A LIST OF ALL NEW ITEMS: FRESH PAINT JOB (3 Coats Of Base & 3 Coats Of Clear), Water Pump, Belts, Fuel Filter, Fuel Line, Voltage Regulator, Battery, Cables, Brake Master Cylinder, Valve Cover Gaskets, MSD Spark Plugs Wires, Spark Plugs, Shocks, Drive Shaft Universal Joints, Rear Brake Shoes, Rear Wheel Cylinders, Stainless Steel Rear Cross Member, Complete Stainless Steel Exhaust System, Chrome Exhaust Tips, 4 Hankook Tires, Seat Covers (Front & Back), Hood & Trunk Rubber Seals, Studebaker Quarter Window Emblems, and Oil & Filter With Zinc Additive. REBUILT ITEMS: Alternator with New Brushes, Diodes, & Bearing. The Power Steering Pump with Bearing & Seals. Finally, the Carter AFB Carburetor. ADDITIONAL INFORMATION: The Transmission was Serviced with a New Pan Gasket & Filter and New Type F Transmission Fluid. All Bands were Adjusted. All Guages Work except the Clock. All Chrome & Stainless Steel is a 9.5 out of 10! Hog Troughs are VERY GOOD…NO RUST!! BUY WITH CONFIDENCE!! I HAVE A 100% POSITIVE FEEDBACK RATING FROM ALL MY CUSTOMERS! !